Gluten Free Food At Comptoir Libanais Exeter | The Free From Fairy. 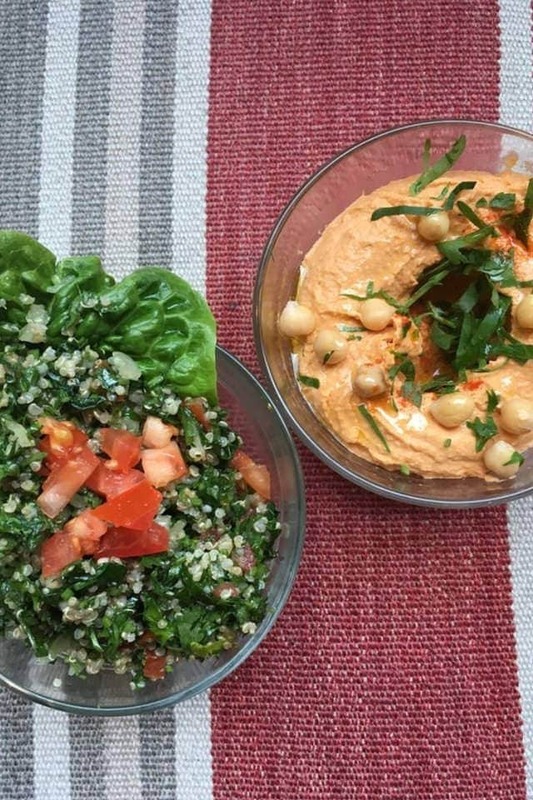 Read about our experience of gluten free food at Comptoir Libanais. If you have an intolerance to gluten or can’t eat it because you have coeliac disease then this is a great restaurant. We were given a free meal but were not requested to review the restaurant. All opinions are unbiased and true. 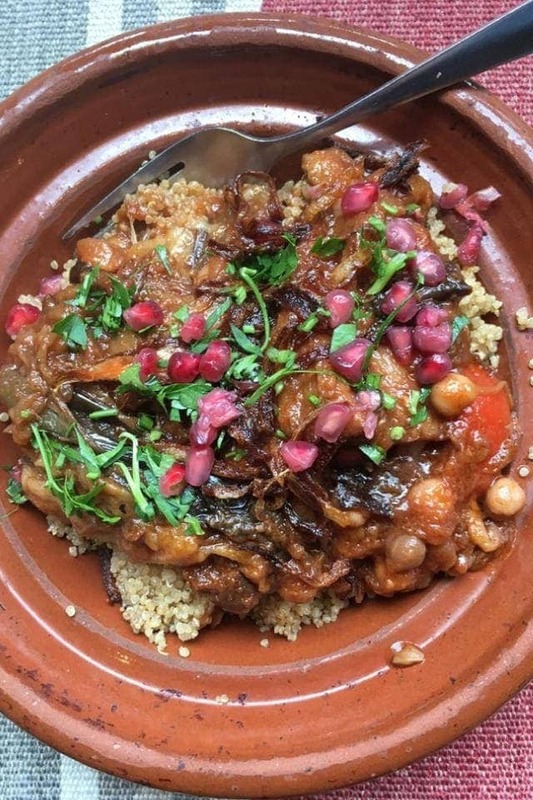 A few weeks ago we were invited to Comptoir Libanais in Exeter to try out their vegan feast menu. Obviously with me and ‘Roo’ eating minimal dairy this seemed like a great opportunity. However, usually these set menus are no good for us because of having to avoid gluten too. I contacted the restaurant in advance of our visit to find out whether they could accommodate us. Both in advance of our visit and during our visit they were incredibly reassuring about the processes they have in place to provide gluten free food that is not contaminated. Mr M and I both had the vegan feast menu. This was a set menu for January that consisted of three courses for £12.95 per person. The starter (pictured above) was red pepper humous and quinoa tabbouleh. Both dishes were naturally gluten free. Normally this course is served with pitta bread but because we are gluten free they gave us carrot and cucumber batons to use for dipping. For the main course there was a choice of aubergine tagine or a cous cous salad. Once again, the aubergine tagine was naturally gluten free and tasted amazing (pictured above). Ordinarily it is served with rice which for some strange reason isn’t gluten free. However, we were offered quinoa instead. The desert was also naturally gluten free (pictured below). It was a Lebanese milk pudding called mouhalabia. 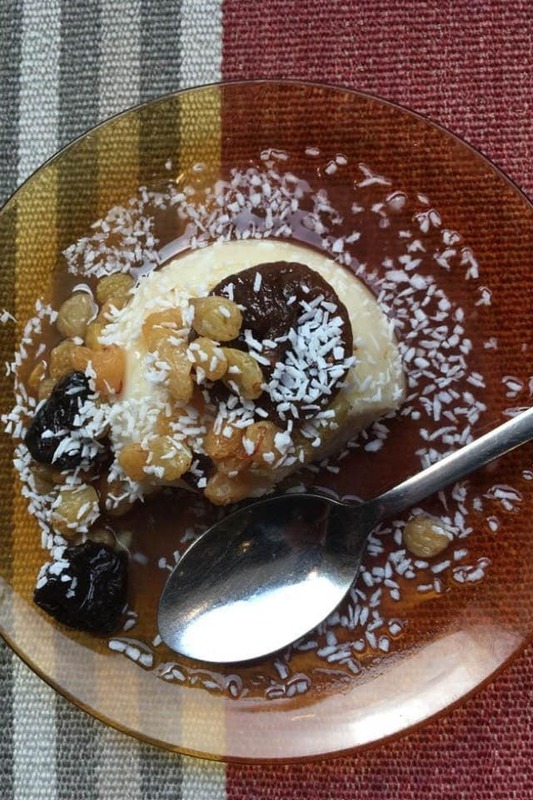 This is traditionally made with cows milk, but for the vegan menu was made from coconut milk. Since Mr M is not a fan of coconut they were very accommodating and allowed him to choose a different desert. He had the dark chocolate and red rose berry cake. Again a naturally gluten free desert that is to die for! All three courses were enormous and I struggled to finish any of them. What gluten free food was suitable for children? The children’s menu is very comprehensive at Comptoir Libanais. Two courses plus a drink is just £5.95 for kids under 10 years old. ‘Roo’ chose the grilled chicken taouk. This was a marinated chicken breast, grilled and served with Lebanese potatoes (little fried potatoes) and humous. ‘Sunshine’ chose the chicken wings which were also marinated and grilled and served as above. I wouldn’t say either of my kids were particularly adventurous but they adored these meals. The staff were also incredibly accommodating and understanding of children’s needs. Rather than make them wait for their meals while we ate our starter they offered to bring them at the same time. Then when we were eating our main they offered them their desert. They also had colouring activities to do to stop them from getting bored. Is there anything that would improve the gluten free experience? The food and service were incredible but there are a couple of things that would improve the experience for those who are gluten free. Although meals are marked as being (gf) there are some that aren’t but can easily be adapted. Like removing the pitta and serving with vegetable sticks instead. It would really help customers if this was clear on the menu. Secondly, because they cater so well for people with coeliac disease it seems a shame that they don’t have Coeliac UK accreditation. This gives us a huge amount of reassurance when eating out and would mean the chain would attract more gluten free customers. At the moment they don’t make much effort to let people know they can cater for those on a gluten free diet which I think is a shame. Overall, I would highly recommend the gluten free food at Comptoir Libanais and we will return. Please bear in mind that we have only tried the food at the Exeter branch. If you have allergies or intolerances please check with your local branch to ensure they can cater for you. Great post! I’ve never thought about try gluten free foods but this post has certainly brought it to my attention. Talk soon, Luke. I’ve been wanting to try gluten free alternatives but they are so hard to do sometime and quite expensive.